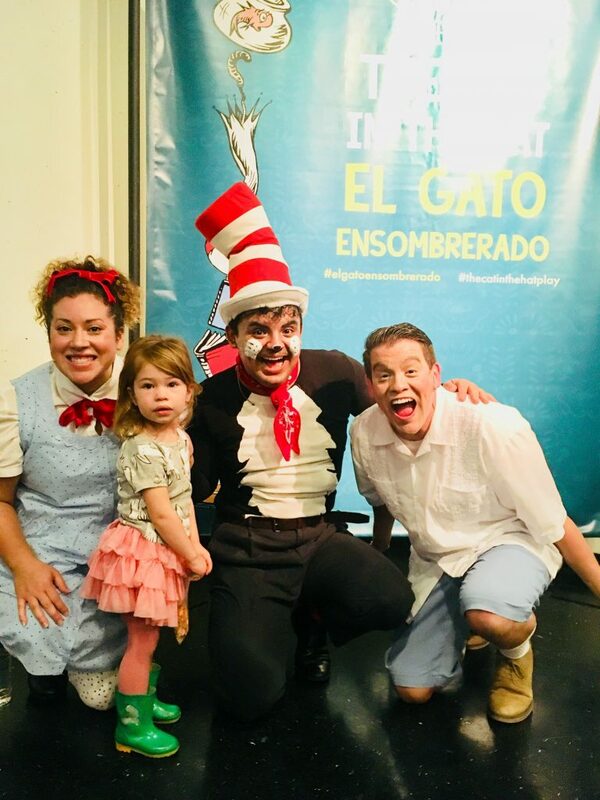 The first page of Dr. Suess’s “Cat in the Hat” springs to life in the opening scene of Bay Area Children’s Theatre’s bilingual “El Gato Ensombrerado.” There’s that window, in signature Dr. Seuss style, where Sally (mischievous, high-energy Carolina Morones) and The Boy (endearing, energetic Daniel Quezada) sit glumly, staring out at the rain. And then, in a set transformation that evokes a cinematic zoom, we are suddenly inside the familiar living room with the kids and their pet fish. Although the kids eagerly anticipate the Cat’s arrival, instead of diving right into the plot of the book, Director Karina Gutierrez eases us into a world where reality is suspended and imagination rules supreme. The highlight of the preamble is a dream sequence with an enormous puppet of the Fish/Pez, (lively Jennifer Vega). Pez delivers her lines in Spanish only, but she is so delightfully animated that the meanings are crystal clear. 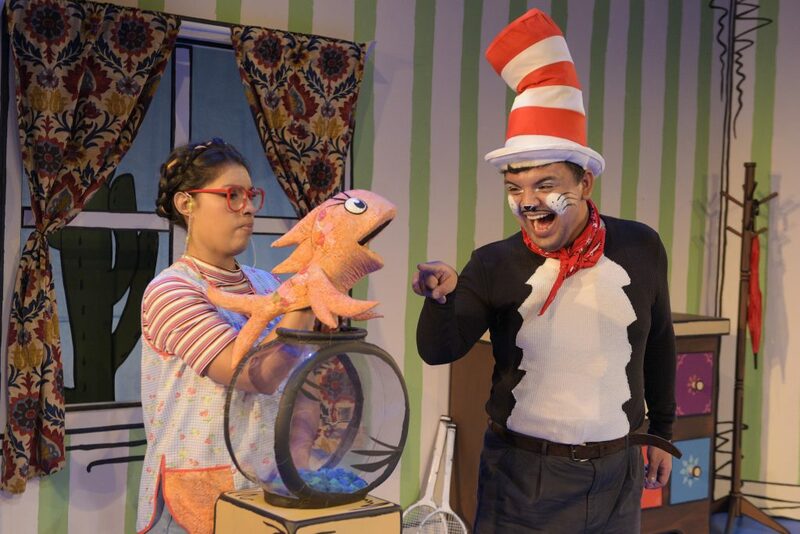 Jennifer Vega (Fish-Pez) & Christian Arteaga (Cat in the Hat-El Gato Ensombrerado). When the inevitable “bump” comes, announcing The Cat’s arrival, the tension is palpable. And when The Cat/El Gato (charismatic, magical Christian Arteaga) emerges from the doorway, the mood in the theater tangibly changes. The young crowd is amped for the trouble they know this lovable rascal will bring. Wacky mayhem ensues, quickly spilling into the excited audience. The Cat coughs up an imaginary hairball and discovers it bounces like a tennis ball. 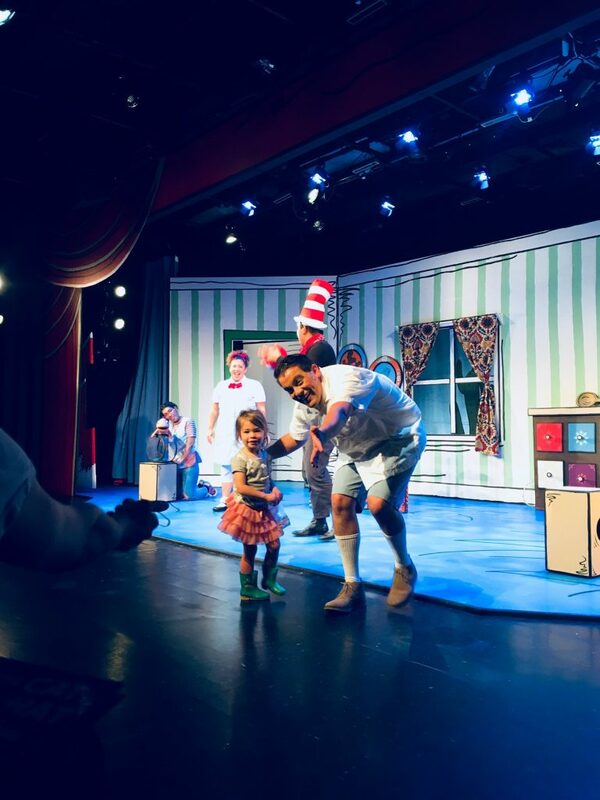 He tosses it to several half-disgusted, half-mesmerized toddlers before inviting the entire audience to cough up their own hairballs. Then a real ball comes out, and several children are coaxed into coming on stage to toss it back to him. To my utter amazement, my daughter, Itasca, two years old, hopped off her seat. Unlike the Cat in the Dr. Seuss books, who comes off as a destructive psychopath, we feel for this Cat. He shifts from prideful to embarrassed, curious to conniving, always looking to us for understanding and approval. When Pez demands that he leave after Thing 1 and Thing 2 destroy the house, Cat’s dismay and regret touch us deeply. BACT’s “Cat” sports a Charlie Chaplain charm, including clever slapstick sequences without dialogue. Even dialogue-heavy parts of this gem unfold with finesse, despite frequent switches between English and Spanish. 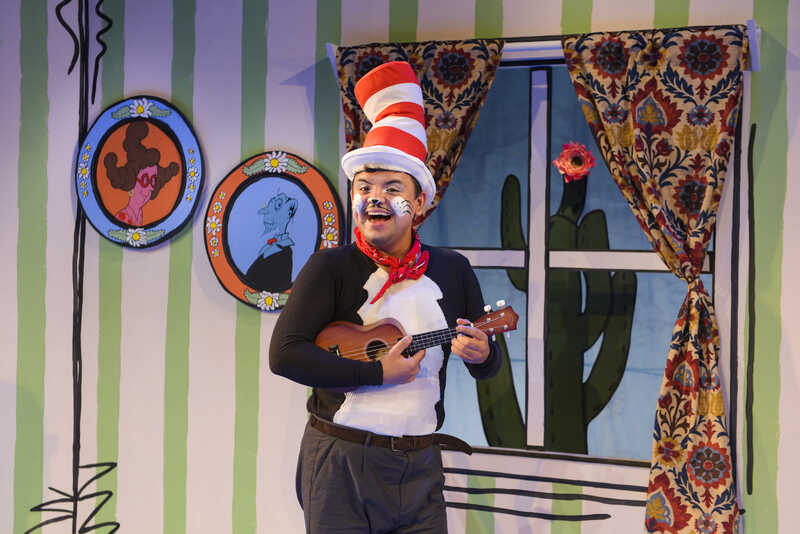 In fact, “The Cat in the Hat / El Gato Ensombrerado” demonstrates how to pull off a bilingual children’s production with utmost insight, skill, and loads of fun. At the very beginning, the actors simply explain that two languages will be used in a way that informs and welcomes the young audience. Then, they all participate in and celebrate the unique experience. As the play unfolds, language takes a back seat to engaging storytelling, a vibrant cast, and the fanciful set with its stockpile of incredible props. To say this a must-see is not enough. If you have kids, don’t dare miss this production! Cast: Christian Arteaga, Carolina Morones, Daniel Quezada, Lesly Ramirez, Kitty Torres, and Jennifer Vega.